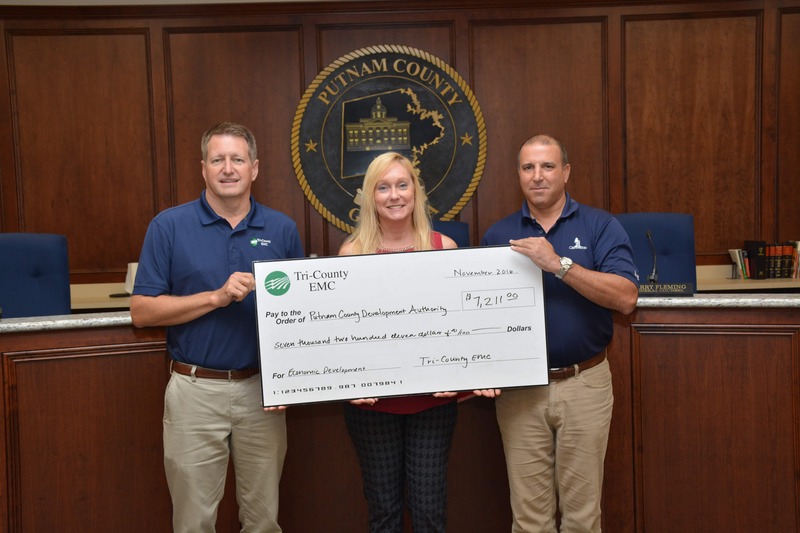 Greg Mullis, Senior VP of Energy Services, and Ray Grinberg, CEO, both of Tri-County EMC, recently presented a $7,211 check to Terry Schwindler, Economic Development Director, Putnam Development Authority, to go towards economic development in Putnam County. These funds are from unclaimed capital credits, or margins that the non-profit cooperative was unable to return to former members. In years past, unclaimed capital credits were surrendered to the state of Georgia. However, House Bill 431 allows Georgia’s EMCs to use these funds that have been retained for five years for education, economic development and 501(c) 3 charitable organizations in EMC service areas. “We are very excited about having the ability to use these funds locally. While we cannot use them for the cooperative’s expenses or to offset our rates, we can put them to work in the community,” says Mullis.